Website Backup Canada - Online Backup Canada - Cloud Backup Canada - CodeGuard Website Backup Calgary, Alberta Canada! Cloud Website Backup Get automatic, cloud-based website backup today! If and when something bad happens to your website, you can simply restore your website to a prior working version in just a few clicks. It's extremely easy to use! Try Cloud Website Backup Now! Why you should regularly backup your website? Yes, the unfortunate reality is that your website is always at risk of crashes, data loss and hacker attacks. Would you like to receive peace of mind today? - If so, you can sleep easier by signing up with backup service provided by CodeGuard. Started in 2010, CodeGuard backs up hundreds of thousands of websites and databases at industry-leading reliability levels. Cloud Website Backup that is easy to use! Why worry about manually backing up your data? CodeGuard makes it easy for you by automatically turning on with the press of a button. This takes the guesswork and time out of having to remember to do it yourself. Do not worry about wasting a lot of time getting set up with CodeGuard because it is a very simple and hassle-free process. Add your connection information and you are ready to go! For added piece of mind, CodeGuard offers a 30 day money back guarantee. Some things work for some and for others, they don't. Give CodeGuard a try and if it is not for you, you can get your money back, you've got nothing to lose. How Cloud Website Backup works? Connecting a website is extremely easy. Either click the "Connect" button in cPanel or enter SFTP/MySQL information into CodeGuard's dashboard. Once connected, an initial backup will start automatically. Just by simply checking your email, you will find any and all updates from CodeGuard. The system keeps a close eye on everything that is going on within your website and will send you an email of any changes. Backups are stored on Amazon's Web Services Simple Storage System called S3. Whenever you need to restore any of your backup data, simply visit your dashboard to retrieve any information you need. If you missed it: CodeGuard backs up your website in the cloud - Great to protect against hacked sites! Safeguard Your Website with Automatic Backups and Never Lose Data Again! 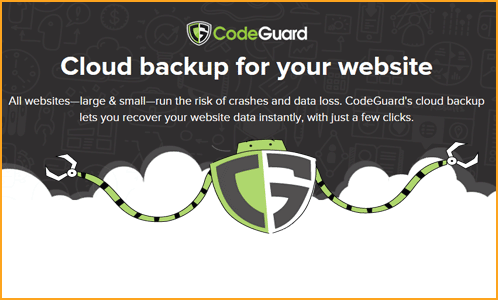 Everyday more than 200,000 customers rely on CodeGuard's website backup service.